The central teaching in Stress, Spirit, Science is that when we are well connected out, in and up, we can thrive under pressure. Connecting out means social support; connecting in refers to ourselves and creation; connecting up has to do with ethics, values and the divine. Many years ago, I had a powerful connecting out experience when I decided to take a risk by sharing a painful story. My friend and roommate, Dave Land, and I had started attending Bethel Lutheran Church in Cupertino, in the heart of Silicon Valley. 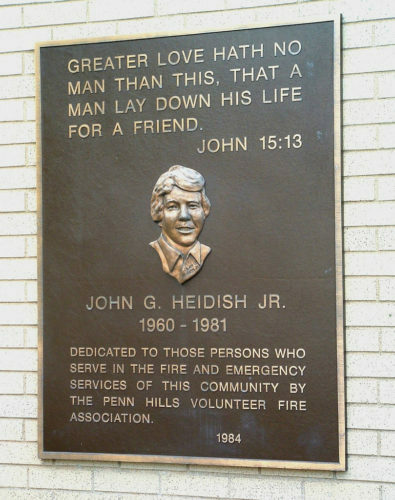 For an upcoming young adult retreat, I had decided to tell about my friend John Heidish Jr., the popular president of the Penn Hills, Pennsylvania, volunteer fire department. He was a fellow volunteer with the Salvation Army Emergency Disaster Services and was burned to death in a flashover at a house fire just days before his 21st birthday, a year before I moved to California. I created a “multimedia” presentation, which in those days meant a slide projector triggered by tones in a sound track on a reel-to-reel tape recorder. I used James Taylor’s Fire and Rain as background music. The images were from my fire photos, with “rain” from firehoses. The Methodist church where John’s memorial took place had pew Bibles and so, with nothing else to do, I picked one up and opened it. I like to read. It opened to John, chapter 13. The first words I read were verse 15, “Greater love has no one than this, to lay down one’s life for one’s friends.” They struck me as terribly, terribly appropriate. At Bethel, I had begun to realize that John’s funeral had affected me deeply. I drove the Sally Wagon (the Salvation Army’s mobile canteen) to the service and arrived early because we knew it was going to be heavily attended – fire companies were traveling long distances, even coming from surrounding states, to pay their respects. The pastor used John 15:13 as the theme of his message. At the cemetery, he read the verse again as John’s coffin was lowered into the ground. Those words came back to me in California during Bethel’s young adult group Bible study, when we read Luke 24, the story of grieving disciples on the road to Emmaus, who meet a stranger who turns out to be Jesus. “Were not our hearts burning within us while he talked with us on the road and opened the Scriptures to us?” echoed how John 13:15 had touched me. I call that my “Emmaus experience,” when I realized that I was no longer just curious to know more about Christianity, but I had come to believe that its stories and teachings are deeply true, offering a path that leads away from death and toward life. At the retreat that day, with my slide projector and tape recorder, this was the story I told my new friends. When the tape ended, I shut off the projector. The room was completely silent. For a moment I thought that they had all fallen asleep. Then I realized that some were quietly crying. I had experienced my own strong, uncomfortable emotions while creating the story, but I had no idea it might also deeply touch others. More than anything else, I found it intimidating, even scary, to provoke such strong feelings. As a radio and newspaper reporter, I had sought to be provocative, but this was so different – I was “reporting” about myself and receiving tears of empathy. In the safety of that church retreat, I felt new and unexpected connections to my friends. I shared that story more than 30 years ago and I’m still a member of Bethel Lutheran. Although the people and pastors have changed over the decades, it continues to be a refuge where we lift one another up and share burdens. In telling my story about John Heidish, I had begun to see how I could revise the past. His story was no longer just a tragic line-of-duty death; my friends and the Bible had given new meaning to his spirit of service, his life and death. My story about John’s life and death touches the three spiritual themes of Stress, Spirit, Science – metanoia (often poorly translated as “repentance”), redemption and creation. Writing a new story helped me think differently about John’s life and death (metanoia); I discovered spiritual meaning in his sacrifice (redemption); and the retreat itself was a gift of presence and grounding, soil for new growth (creation) as we left behind day-to-day distractions.